I have traded IPOs for many years. The only unusual aspect of the Facebook fiasco is its size. Look back to the 90s and recall the insane valuations and the corruption and intrigue. Remember the CSFB scandal and all the other shenanigans. I have had endless letters from US lawyers over the years asking me to join law suits and collective actions resulting from IPOs. A lot of people are glum about Facebook and it has certainly not cheered the market. I also feel sorry for those who got suckered who thought it a long term buy. Those who stag new issues though would have been out flat or better on the first day and simply shrug their shoulders and move on to the next deal. There have been a number of highly successful deals in the US this year and a few in the rest of the world. There have been some good premiums in secondary offerings and in fixed income deals. The trader doesn't give a toss about Facebook. Its a numbers game. Shrug and move on. AFJ Garner wrote: I have traded IPOs for many years. The only unusual aspect of the Facebook fiasco is its size. Look back to the 90s and recall the insane valuations and the corruption and intrigue. Remember the CSFB scandal and all the other shenanigans. I have had endless letters from US lawyers over the years asking me to join law suits and collective actions resulting from IPOs. How does a typical IPO play work? How does an IPO play work? In my experience (Australian equities) - just as Mr Garner says - its a numbers game. You maintain as many accounts and good relationships with various brokers over years so that they give you good allocations in IPOs. In a bull market you leverage yourself up a lot and hope to get out on the first day of trading (maybe you run some of it) and just keep doing the deals, looking to capture lots of small wins and minimise a few losses. This can also be applied to stocks doing capital raisings etc if the discounts are good, and the markets are running. For my two cents its not for everyone, works well when the market is running hot - but then so does most things. Yep, that's how it plays. But when the markets are not propitious you just sit on the sidelines: you don't bleed to death as markets chop. And it does have its terrors. Just different ones. Illiqidity and syndicates who walk away from deals being the major ones. Good lead managers and good liquidity usually mean getting out flat or a little down at worst. But there are the occasional shockers. No free lunch .....and it does mean you actually have to talk to people. Never one of my strong points. For all its valuation, the social network is just another ad-supported site. It needs an earthshaking idea. Michael Wolff wrote: Oh, yes ... in its Herculean efforts to maintain its overall growth, Facebook will force the rest of the ad-driven Web to lower its prices, too. The low-level panic the owners of every mass-traffic website feel about the ever-downward movement of their CPM is turning to dread. Last quarter, some big sites observed as much as a 25 percent decrease, following Facebook's own attempt to book more revenue. You see where this is going. As Facebook gluts an already glutted market, the fallacy of the Web as a profitable ad medium will become hard to ignore. The crash will come. And Facebookâ€”that putative transformer of worlds, which is, in reality, only an ad-driven site â€”will fall with everybody else. note: CPM is the sales price of an online ad. Cost per thousand ad impressions. [quote="Michael Wolff"]Oh, yes ... in its Herculean efforts to maintain its overall growth, Facebook will force the rest of the ad-driven Web to lower its prices, too. The low-level panic the owners of every mass-traffic website feel about the ever-downward movement of their CPM is turning to dread. Last quarter, some big sites observed as much as a 25 percent decrease, following Facebook's own attempt to book more revenue. 1) A world wide audience. the technology comes in a few years. Don't think for a second that a website will be the only medium they advertise with. Augmented reality is coming. So is person specific offline ads a la Minority Report. I would not buy here...lots of time to get in this. Just wait for the next bear market like Buffett does. Was Zuck allowed to buy puts on IPO day? Any guesses?? Bottom??? Cut in half again? DPH wrote: Was Zuck allowed to buy puts on IPO day? Guess? Who knows. I will start looking at it when breaks through the $20 mark which might happen today. Until then, not too worried about it. I have to admit that Facebook's new "Graph Search" really does seem like it might be pretty cool. I have not used it (but signed up for when its available), however just reading the press releases I am intrigued. There is no question they have unimaginable amounts of data to mine! I am also intrigued by the integration of Facebook and Microsoft's Bing search engine. If you don't know about this, basically Bing will integrate your social circle (friends) into the relevancy rankings of your search results. 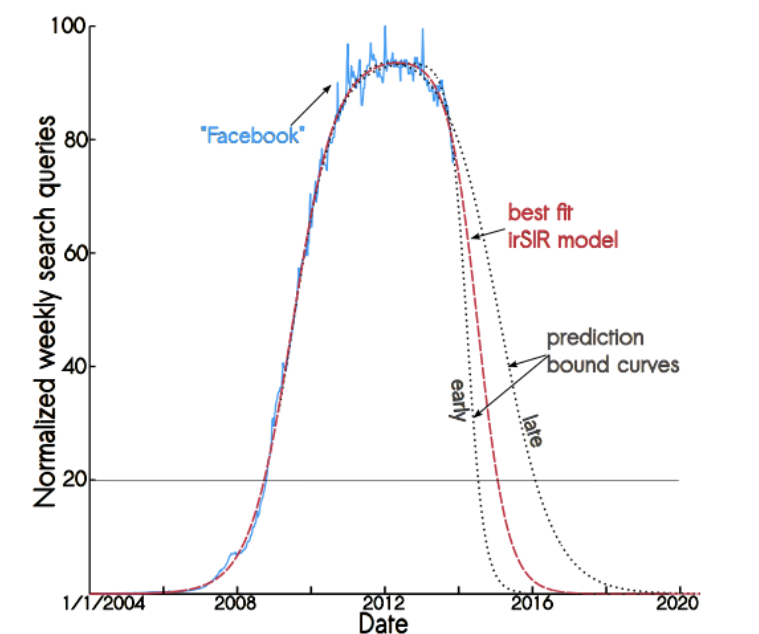 The number of searches on Facebook seems to be well-modeled by an infectious-disease recovery equation called "irSIR". Projecting that model into the future, it shows that the internet recovers from the infection called Facebook between 2015 and 2017. One article is HERE, and you can Google for others.